The Kaisa Festival Trade Fair is a showcase of locally-produced products and services in the City of Tarlac. Colorful fiesta banderitas and upbeat music will welcome the goers as products and services were beautifully presented for the public’s consumption. From the Tarlac City Agriculture Office’s organic farm products, Kaisa Women’s Organization’s water lily and citronella products to locally-made pastries and delicacies, buyers will surely experience a one-of-kind offer. 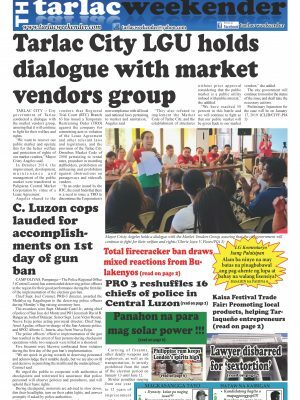 According to Dr. Mina Tañedo of the City Cooperative and Enterprise Development Office (CCEDO), the conduct of the Trade Fair is one way of the city government’s intervention in promoting local products produced by local entrepreneurs and thus, strengthening their capability to increase market and production. Aside from products, one remarkable service from the Trade Fair is the “Angel’s Touch Massage” being offered by our Persons with Disabilities (PWD). Personalized shirt printing and a photo booth are also available in the event.